Our children hit to express themselves and get their needs met. If they had another way to manage their feelings and relationships, they would do so. Most children and adults do the best they can, in the moment, with the skills they have. The reasons for hitting vary for each child, you may wish to consider whether the child is experiencing anger, upset, frustration, boredom, disappointment, loneliness or other related emotions. Manage the moment. In the moment of the intensity we focus not on speaking but on calming. The emotional brain responds to limbic strategies not lots of words and instruction. First ~ You are your children’s best teacher. How you manage their hitting impacts their developing skills. So quietly step close to them and express confusion over what is happening. “Boys, I am confused about the fighting.” This engages the “Thinker” the frontal lobes in their brains. Then provide a solution. 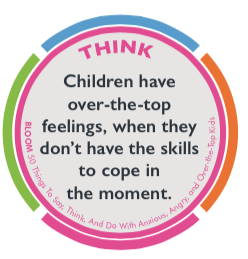 “It’s a good time for us to go play outside.” When you use Bloom, eventually, you will have an entire list of strategies, words and actions to use when the moment is intense, for now, the very first time, it is helpful to change their setting. Next time, you will better manage their space as they play. 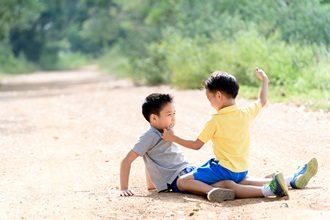 Second ~ Then, when the children are calm and safe, we circle back to prepare and prevent future mishaps by developing strategies including “Calming Cues” and “Anger Toolkits” so that the children are empowered to choose another behavior next time. Create a culture of kindness.When the children are calm, circle back to teach them that we live in a family where we respect one another with our words and our bodies. We are kind to one another. The first three chapters of The Family Coach Method can REALLY help you here. Focus on feeding the children whole real organic food.There is ample research that what we eat impacts how we feel and behave. If we are not feeding our bodies quality proteins, fats and complex carbohydrates, the body and brain cannot do their best. We love 100dayofrealfood, you might as well. Few children hit when they are happy. Hitting is a way of saying, “This really is not working for me right now.” “My feelings are TOO BIG.” “I do not have the skills to work this out in a more cooperative way.” A child who is hitting is asking you to help them! The magic is in using the mantras to help you calm the children now and then Managing The Moment to help everyone find a new way to manage their feelings when an impulse to be aggressive appears again.